Rose’s mother had been critically injured during a poaching attempt nearby Nyamundwa dam close to the Phabeni gate of the Kruger National Park. Her mother was shot in the front leg causing her to be unable to walk. The Park’s rangers got to the mother and calf before the poachers could remove any horns. The mother was still alive when the vets arrived but due to the severity of the injuries, the rhino cow had to be euthanized, leaving behind little Rose Petal, an orphan. Rose was taken to the Skukuza bomas on the 13th June 2017 where she was monitored. The next day, it was decided to send Rose to the specialised care of Care for Wild Rhino Sanctuary where she would learn to drink milk from a bottle and grow up with rhinos more her size and age. Rose arrived at Care for Wild Rhino Sanctuary in a crate on the back of a truck on the 14th June 2017. Rose’s name came from the beautiful colour of a soft pink rose petal. Her very own baby blanket is also pink. Her pink blanket was her warmth and comfort during her first few cold days after arriving and settling in at her new home. Rose was about 5 months old on arrival and was clearly very stressed. The Care for Wild team used Equissage equipment to massage Rose back to sleep when she got scared or restless. Later that night, Rose drank her first bottle of milk. Once Rose was on a regular schedule of milk feeds, she settled down and was ready to see her new world. As soon as her blindfold was removed, she investigated her nightpen for 10 minutes before falling asleep happily. Rose would enjoy listening to Khanya who would whisper to her at the door each day. On the 18th June 2017, Rose finally met Khanya, who was much bigger than her. Rose felt quite intimidated by Khanya’s ‘big personality’. 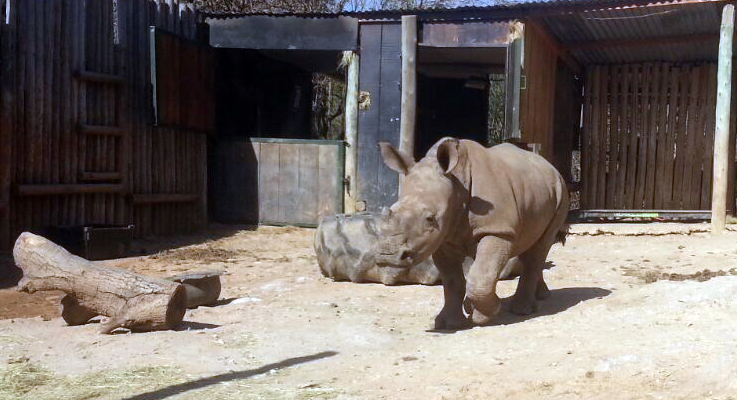 Rose let out a few bellowing growls at Khanya to show Khanya she is big and strong too. Khanya accepted Rose’s terms and conditions, and began their forever friendship immediately after. Rose was weighed for the first time on the 22nd June 2017 and weighed a healthy 179kg! Rose has been growing well, despite having an unsettled tummy in her first month. The two orphans are still currently in the ICU due to their small size, young age and the cold winter. After the winter cold spells break, they will be moved down to the bomas where they will meet some of the other older orphans.